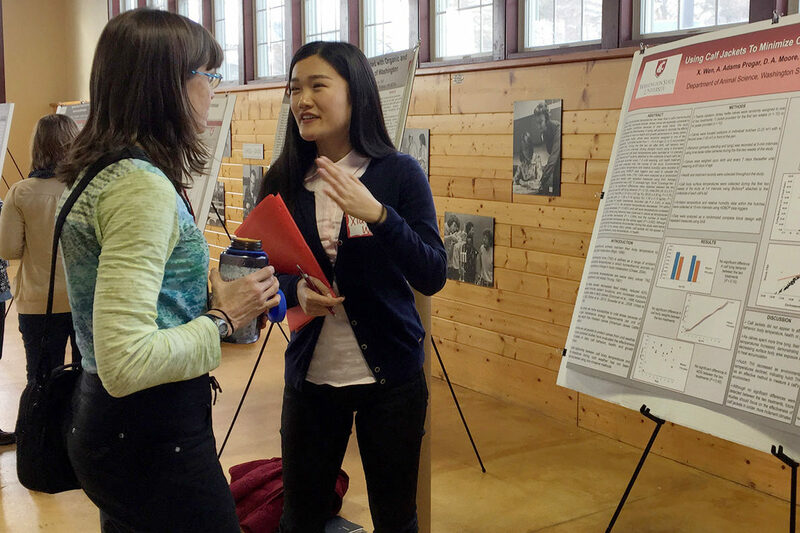 Students and researchers exchange ideas at a poster session at the previous BIOAg Symposium at Washington State University. Exploring the link between health and agriculture, researchers at Washington State University’s Center for Sustaining Agriculture and Natural Resources will host the 2019 BIOAg Symposium, Thursday, Feb. 7, in Pullman. BIOAg stands for the biannual Biologically Intensive Agriculture & Organic Farming program, which is the flagship grant program of the Center for Sustaining Agriculture and Natural Resources (CSANR). BIOAg advances the use and understanding of biologically intensive, organic and sustainable agriculture in Washington state. Themed “The Intersection of Agriculture and Human Health: Developing Opportunities for Research and Education,” the program’s 2019 symposium includes a poster session and panel discussion with associate professor Kevin Murphy of the WSU Department of Crop and Soil Sciences, and professor and vice dean John Roll, and associate professor Pablo Monsivais of the Elson S. Floyd College of Medicine. In the BIOAg poster session, scientists and students will showcase work on biologically intensive agriculture, organic production, and farming practices that are renewable, nonpolluting and mutually beneficial to growers and society. The poster session was created to share information, build teamwork and help the BIOAg program set future priorities, and also gives students a chance to win scholarships. The 2019 BIOAg Symposium begins at 3 p.m. at Ensminger Pavilion on the Pullman campus. Admission is free. To learn more, visit the event page on the CSANR website. Learn more about the event on the BIOAg website.